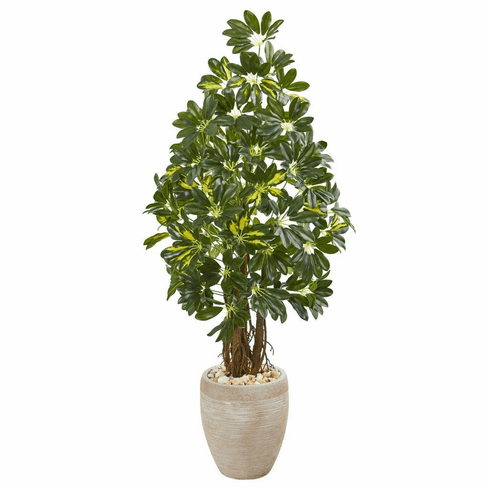 The artificial schefflera features a single head of lush, variegated green leaves with yellow tints that seem to grow straight out of the simple sand colored planter. topped with river rocks At 4.5-foot tall, this tree can fill in any tight or bare corners in your home or office. Or, you can bundle this piece together with other artificial flowering plants to instantly create a tropical beauty in your space. Height: 4.5 Ft., Width: 24 In., Depth: 24 In., Color: , Pot Size: H: 12.5 In. W: 11 In. D: 11 In.